Product prices and availability are accurate as of 2019-02-09 21:50:01 UTC and are subject to change. Any price and availability information displayed on http://www.amazon.com/ at the time of purchase will apply to the purchase of this product. 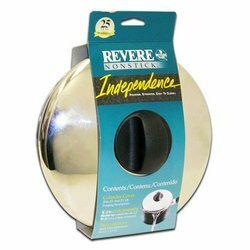 Revere Nonstick Independence 7" Colander Cover. Colander cover fits 2.5 and 3.5 Qt. Pouring saucepans. Constructed of stainless steel. Easy-to-grip knob.